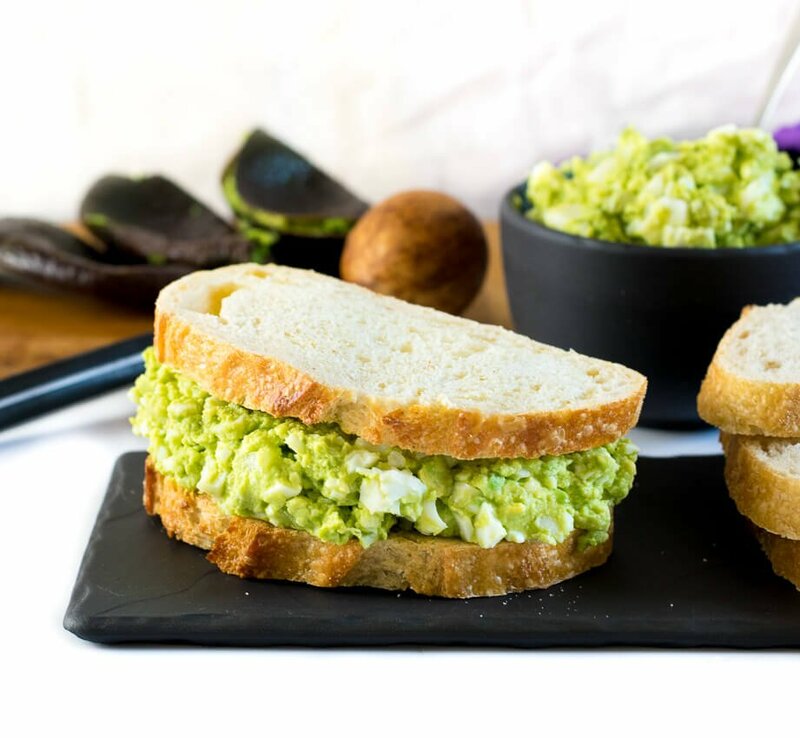 This Healthy Avocado Egg Salad is made with simple all natural ingredients and is mayo free. Avocado adds flavor to this creamy classic without the guilt! Who decides when something qualifies to be a salad? Egg salad doesn’t seem very salady to me, but I guess I’m no expert in the fine art of salad designation. However, somewhere along the line someone decided that when protein is tossed with excessive amounts of mayo, it counts as a salad. This was no doubt coined by a man whose wife was nagging him to eat more salads. However, that doesn’t mean we can’t twist the classic egg salad into something equally enjoyable to consume, yet healthy. Actually, I may like my Healthy Avocado Egg Salad version better. I am kind of obsessed with healthy avocado recipes. Open-Faced Avocado Sandwich with Egg and Parmesan anyone? This is one of my favorite go-to lunches! 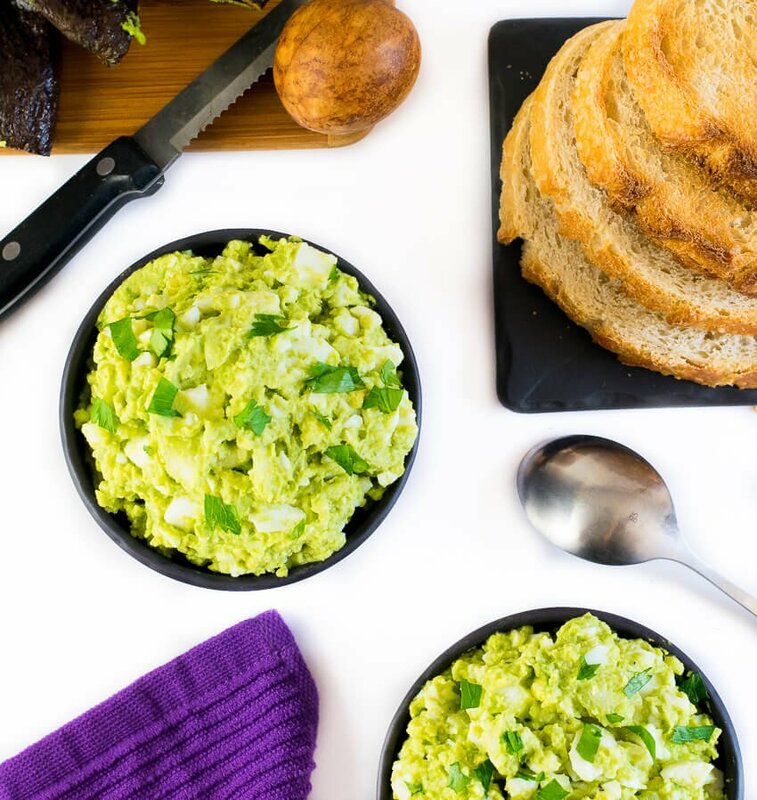 You can eat this Healthy Avocado Egg Salad with no mayo and not feel bad about indulging. Avocado provides plenty of creaminess and more flavor than mayo, making it the perfect way to update a classic! If you don’t know how to boil eggs perfectly, check out of my guide to perfect boiled eggs. It is an older post that could use a stylistic face-lift, but the content is spot on! This recipe requires no cooking, simply stir/mash the ingredients together. You can use a fork or a potato masher (affiliate link) to cut down the eggs and avocado, but do you know what really works well? A simple pastry cutter (affiliate link). Its blades are perfect for ensuring everything gets broken down without a big hassle. It really makes this recipe quick and easy. Avocado Egg Salad is best enjoyed immediately. Avocado does not have a long shelf life once the air reaches it, as it will quickly turn black from oxidization. 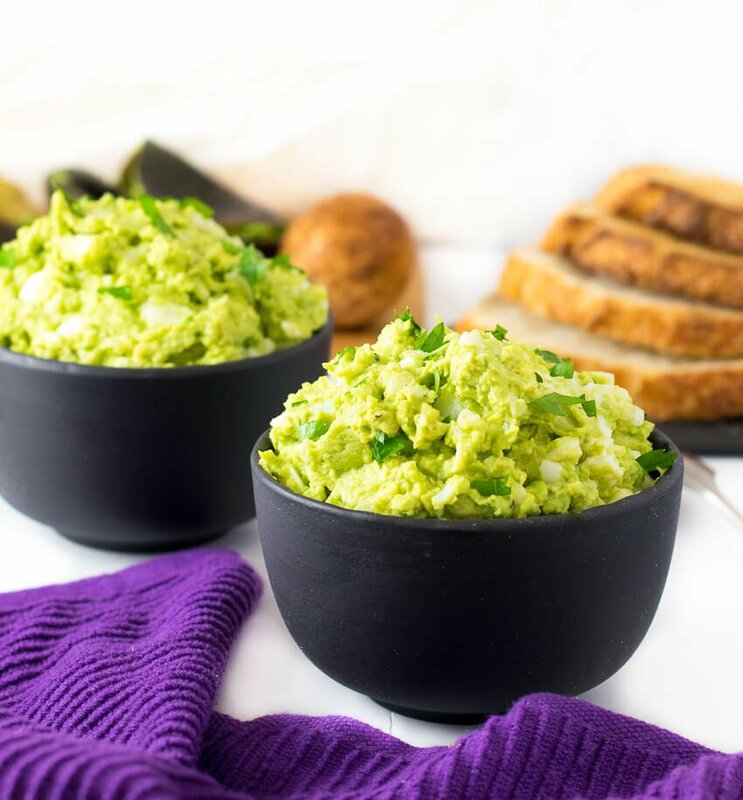 Adding lemon juice to this recipe not only adds a bright punch of flavor, but it also helps prevent the avocado from oxidizing. If you have leftovers that need to be stored, the best way to do so is placing a sheet of plastic wrap directly over the avocado egg salad to prevent air from reaching it. To be clear, the plastic wrap literally needs to touch the surface of the egg salad. Be sure there are no bubbles or air pockets, or these areas will oxidize. If you enjoyed reading my Healthy Avocado Egg Salad recipe then you should probably like me on Facebook and follow me on Pinterest too. That’s what I would do at least, because if you don’t get to know me but you still use my recipe it is kind of like taking candy from a stranger, and your mom taught you not to do that. Don’t disobey your mom, subscribe to Fox Valley Foodie today. This sounds really good. I use a box grater for my eggs, would work well for the avocado as well I think. I steam my eggs, which works like a charm – 12 minutes. Cheers! Steaming eggs seems like a great idea. I’ll have to try that! This looks so good!! The only thing I would add is bacon — I know, I know not everyone loves bacon but our family does! YUM!! And we have just eh bread to put it on — our homemade loaf bread. It’s not wimpy yet it isn’t tough. Thank you for the inspiration. Bacon would be fantastic! Heck, blue cheese would even be great, if you swing that way! I’ll make this for lunch today, then freshly fueled up with egg-o-cado goodness, I’m going to go out and buy a purple towel. Gorgeous photograph. How do you keep the Avacados from turning the whole salad blackish from oxidation? I eat it. The lemon juice will retard oxidation for a little while, but this is not a recipe that is meant to be made well in advance. You are so amazing! I am super hungry and that looks beyond incredible and healthy mmmmm. I love replacing anything I can that requires butter or mayo with avocado and oh did you make it look scrumptious! Thanks so much for this post! So this is a recipe that’s meant to be eaten right away? Or do you think it’d last maybe 1 night overnight in the refridgerator? Avocado doesn’t store well, as it will oxidize quickly. I wouldn’t make it the night prior. If you want to stretch its longevity, smooth it flat and place plastic wrap tightly over the top of it so there is no air touching the egg salad. Any air pockets will oxidize. If you do that, you may be able to enjoy it the next day, but it will certainly lose some freshness. To stop Avocado from going black pop it into boiling water for a few moments. This was told to me by a good friend who is a CHEF. The eggs should have the shell removed and the avocado should be peeled. Does it call for green onions or regular onions? The top photo looks like there’s some type of green (shredded lettuce?) This recipe looks delicious! Good eye. That is just chopped parsley I used as a garnish for the photo. It isn’t needed for the recipe. Assuming it does a good job sucking all of the oxygen out, I think that could work well. Let me know how it goes! That sounds great! I love things SPICY. I would publish more spicy recipes if there were more people like us. Ok so I dont usually comment on recipes but i really feel like you deserve it. Lol. Avocados always look SOOO delicious but I just cant stand the texture of avocado. I LOVE egg salad but I’m trying to eat healthier so i tried this. I just want you to know this is one of my breakfast prep rotations. It is delicious! 💖 I put it on one piece of toast. Maybe a side of almonds and I am full for a decent amount of time. What is the nutritional information on this meal? 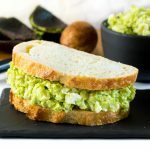 The avocado egg salad sandwich looks really good. I have a friend visiting me here in Belize and she loves avocado. We will try this sandwich for a lunch. The first time I made this I added a little cilantro 😍 this time I added shredded chicken and shredded cheddar cheese! And to mix I used a mixer and it was nice and smooth 🙂 the kids love this in a wrap for lunch, thanks for the recipe!